I made this dinner on September 11, 2016 and stuck the leftovers in the freezer. Since we are leaving Utah for home tomorrow and don’t want to mess up our just cleaned kitchen, tonight is the perfect time for planned-overs. I usually make this dish with chickpeas but cannellini work just as well. The stew tasted just as good as it did the first time but freezing it turned the ditalini mushy. It would have been better to just freeze the vegetable part and add new ditalini into the reheat. 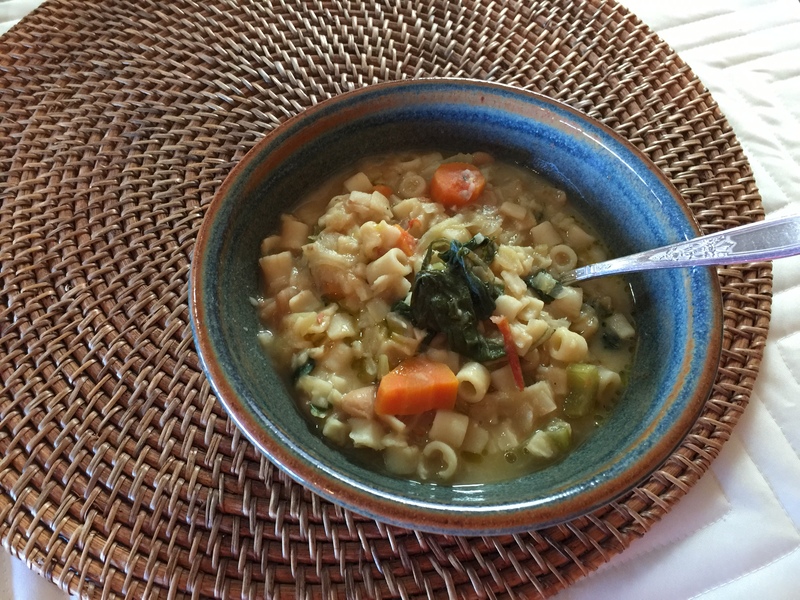 This entry was posted in leftovers, Legumes, Pasta, Vegan, Vegetables, Vegetarian and tagged beans, canellini beans, carrots, Celery, ditalini, greens, Onions, pasta, tomatoes, Vegan, Vegetables, vegetarian. Bookmark the permalink.